Words can't describe Gerry Speechley's Sierra. Donny Morris tries. 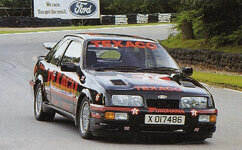 A turbocharger features in the stunning Sierra racing replica. It’s the one that half appears on the cover. Owner, Gerry Speechley put so much detail into the car we should devote an entire issue to it. The engine spec gives an indication. It’s a 2.8 litre V6, fully rebuilt and increased to 2.9 litres. An intercooled turbo was added, along with a nitrous system for an estimated 400bhp. Add that to a car which looks identical to Steve Soper’s World touring car RS500 and you’ve got a winner. Above and right: Superb Pioneer ICE is as powerful as NOS system.Top right: Original con rods didn't like full boost. Bottom: Home-made exhaust passes limited slip diff and exemplifies superb preparation. Gerry cross drilled Cosworth discs himself. They sit on Koni adjustable struts. 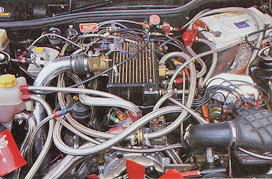 Garrett TO4 turbo on TT manifold surrounded by fuel and NOS lines. 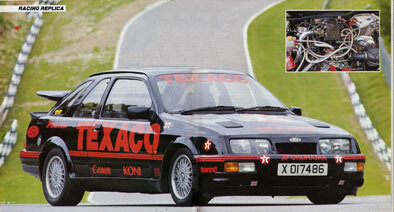 The best known Sierra Cosworth must be the works Texaco RS500. They dominated the world touring car championship, notably with Steve Soper at the wheel. Many would give their right arm just to drive these mighty machines, let alone own one. That’s why Gerry Speechley, a Ford servicing specialist from Camberley, created a road going ‘racing replica’. 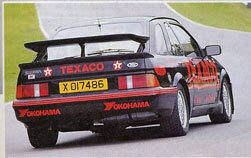 This stunning vehicle is actually based on an XR4i and not a Cosworth. Apparently, the cost of maintaining a factory RS was considered too great. Alternatively, the complexity and power losses from the XR4x4 were unacceptable. But the XR4i provided the ideal combination, with rear wheel drive and the reliable V6 Cologne Motor – an engine which was never fully exploited by Ford. Therefore, Gerry devoted much time and effort tuning the V6 to create a Cosworth beater. Initially, he spent thousands of pounds and hours developing a normally aspirated version. Despite his efforts this culminated in a 35bhp maximum power increase – hardly a Cosworth beater. In an attempt to realise the engine’s full potential Gerry fitted a Turbo Technics turbocharger, based on their Minker conversion, with a reputed 320bhp output. However, this is supplemented with a NOS nitrous oxide kit, supplied by Hatton Enterprises, uprating the power to an estimated 400bhp. To handle the massive power increase the bottom end was reconditioned. The crankshaft journals were micro polished and tuftrided prior to assembly. The complete rotating assembly was balanced, including the front pulley, flywheel and clutch pressure plate. Originally the motor incorporated standard lightened and balancedcon rods but they couldn’t handle the power, eventually twisting like a cork screw. These were replaced with stronger rods from a 2.9 unit, uprated in a similar manner, removing the metal lump at the small end and polishing the beams. Karl Schmidt pistons were matched to each cylinder bore to optimise the fit, with 0.6mm machined off the crown to obtain the required compression. Meanwhile, the cylinder heads received considerable attention. The combustion chambers were enlarged decreasing the compression ratio to 8:1 for the turbocharger. While the larger valves and porting produced a 30% increase in flow on the exhaust port – a critical aspect on turbocharged engines. The inlet valves were constructed from 214N, measuring 1.75”. However the 1.5” exhaust valves are manufactured from tri-metal. Apparently the exhaust collets are designed ‘loose’ so the valve can rotate. EN24 tips were required, friction welded to 214N stems, with stellite seats to reduce valve seat erosion. The valves were chromed to increase life and fitted in bronze guides with heavy duty springs, topped off with titanium alloy retainers. Complementing the turbocharger, a high lift camshaft was selected with shorter duration than stock. This reputably increases the intake charge and exhaust flow but avoids reverse flow. The standard inlet manifold encompasses the NOS system with separate nitrous oxide and fuelling nozzles fitted in each runner. The plenum chamber has been turned through 180 degrees with the inlet, which encompasses an additional nitrous feed, pointing toward the Turbo Technics intercooler. The throttle body is actuated as normal with a micro switch to activate the nitrous at 90% throttle. Meanwhile the Garrett TO4 compressor, situated on the nearside, is mounted on a Turbo Technics manifold. The manifold is sealed to the heads with gas filled copper tubes originally produced for Honda motorcycles. These crush when clamped then expand when heated to provide a tight seal. The gases eventually exit the vehicle confines via a home made 2.5” stainless exhaust system, increasing to 3” with a single silencer box. Utilising the existing petrol tank, the fuel delivery system has been uprated with the pump, accumulator and filter mounted in the spare wheel well. In the engine bay the high pressure fuel supply branches off into the injection metering head, regulator and Micro Dynamics EFI seventh injector. The EFI system provides the fuelling and controls the ignition when the turbocharger is in boost mode. Under normally aspirated conditions, fuelling is controlled by the standard Bosch K-Jetronic system. However a pressure sensing system is fitted to the cold start regulator which increases fuel pressure, under low boost conditions. For larger boost demands the auxiliary EFI system senses both boost pressure and engine rpm to operate an electronic hi-flow injector mounted on the induction system. The ignition retards at a linear rate, but advances at the rpm threshold to eliminate boost retard. Obviously the suspension was uprated to match the engine performance. It has already been proved on the track that slight differences on the suspension settings can enhance the Sierra’s stability and handling. Therefore all suspension components were made adjustable.Koni adjustable dampers were used all round, wrapped in shorter springs up front. The lowering effect increased the camber so adjustable, rose jointed track control arms were manufactured. Separate rose jointed tie bars were also constructed utilising the existing track arm compliance bushes. The larger 28mm anti roll bar was repositioned with adjustable links. The standard Cosworth front hubs were lightened and fitted with longer studs and alloy centre posts to centralise the wheels. The carriers have been slotted 15mm on the shoulder of the strut support, allowing shims to be fitted to achieve the desired ride height. The wheels themselves are of Cosworth origin. Sprayed silver, they’re fitted with Yokohamas, 205/50 ZR15 front and 225/50 ZR15 rear. The rear end is basically standard but with rising rate 250/650 lb springs at 1” lower. The rear anti-roll bar is also uprated and connected to the trailing arms through rose jointed links. The full 400bhp is transmitted through a 9 ½” Cosworth clutch which still slips when nitrous is activated. The standard gearbox, which is due to be replaced with a Borg Warner 5 speed unit, has a rose jointed gear lever for quick selection. A limited slip diff is used, driven by a heavy duty propshaft with Ford Transit universal joints. To keep the insurance man happy, stopping power has been uprated with the addition of 280mm front and 270mm rear Cosworth discs. These are cross drilled to improve surface area cooling and reduce pad glazing. Mintex M171 pads are currently employed, although standard Ford pads are preferred because of reduced noise. 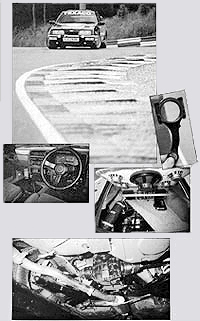 A hydraulic handbrake was grafted into the centre console. To create the racing replica look Gerry fitted a flush 3” aircraft filler cap. Next, the door locks were removed to increase security with electronic entry. The interior is trimmed with standard Cosworth seats and panels, but the more informative XR4i dash facia was retained. In keeping with the car’s image, the sound system is also radical, controlled by Pioneer’s latest KEX CM800 tuner cassette player.The system boasts no less than three amplifiers, with an active crossover split three ways with individual speakers. Bass is taken care of by a TSW400 16” subwoofer mounted in an MDF parcel shelf. Total output is 1120 Watts! Aerodynamics were enhanced by fitting a Cosworth body kit, supplied by Trimoco, with an additional 2.0i tailgate lip spoiler. The RS Cosworth bonnet grilles were also added to help cool the turbo. Sprayed in black, the decals were then added to emulate the original works racers.